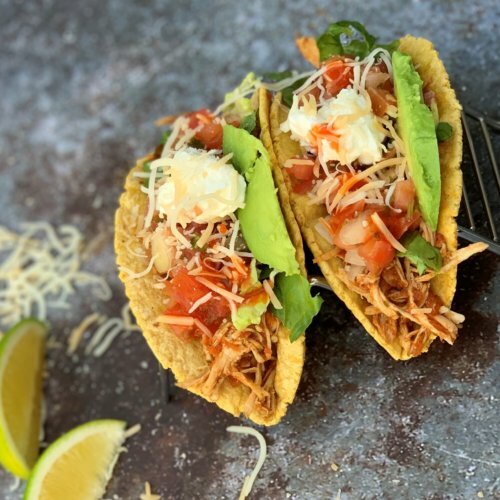 Instant Pot shredded chicken tacos? I’m in! Over the past 14 yrs Mexican food has become a favorite. Growing up in RI all we had was Taco Bell, so needless to say when I moved to San Diego I was in for a nice treat! A lot of Mexican food is jam packed with calories so a great way to avoid that is to cook it yourself. You can control the portion size and the added fat. 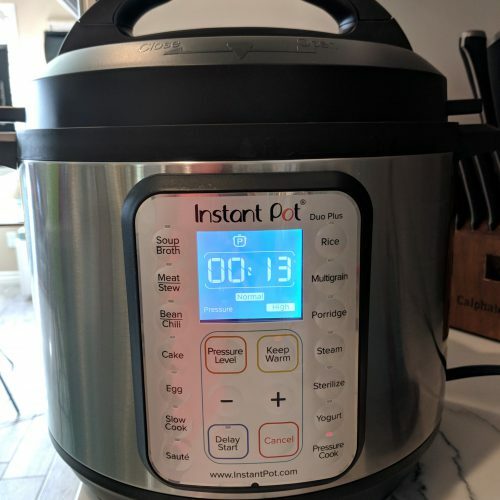 This was the second time using my instant pot and it was much easier! I didn’t have to read the manual (that much) to know what to do and it was so much quicker than using the crock-pot. I am new to the instant pot game, so I kept this recipe simple. Chicken, seasoning, salsa. Boom! This made about 10 tacos for my husband and I. It obviously depends on what kind of shell you get and how much you stuff them. If you buy a large tortilla to make a chicken burrito you are going to have less servings. The macros per taco are as follows! 180 calories, 4g of fat, 17g of carbs, 18g protein. If you are gluten-free just make sure to find a straight up corn tortilla. I love the tortillas from Trader Joe’s (shown below) but unfortunately for you gluten-free folk, they have wheat in them. 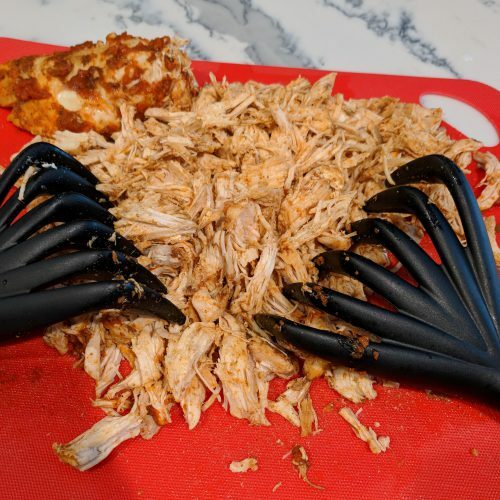 Make sure to buy shredding claws to shred the chicken because it makes life so much easier. (you will still get a good bicep pump regardless). I have learned over the years that having the right tools (especially a good set of knives) is crucial. I used to wrestle with the food when cutting it until I got this Calphalon set for my wedding. It is an investment BUT so worth it. Another great tool that I only discovered last year is an Avocado slicer. Genius!! I know some of you don’t own an Instant Pot but have no fear! You can still make this recipe in the crock-pot! 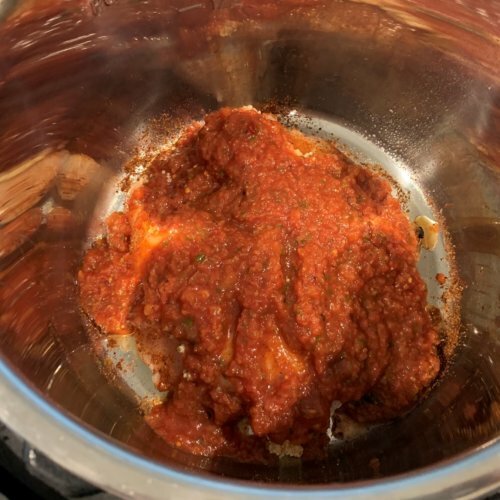 Simply follow the instructions below and instead of placing the chicken breasts in the instant pot, just place them in the crock-pot, season and cover with salsa! Set it on low for 5-6 hours, or until you can easily shred the chicken with the claws mentioned above or two forks! I have to admit I am not the best at toasting the taco shells. I have no clue why, but I struggle. One night, my husband wasn’t home for dinner and I didn’t feel like dealing with it so I turned this into a Chicken Taco Bowl! 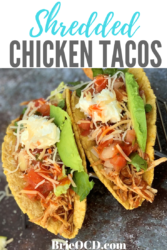 Just take all of the ingredients you use in this recipe (lettuce, avocado, chicken, tomato, cheese, hot sauce, greek yogurt) and add white or brown rice. Mix it up and Voila! Overall this was a very easy and healthy recipe to make. You get your fill of protein, veggies and carbs all in one shot. 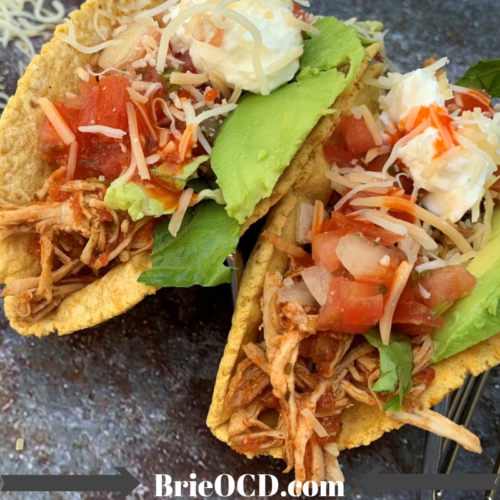 If you love this recipe try some of my other Mexican dishes by clicking on each title! 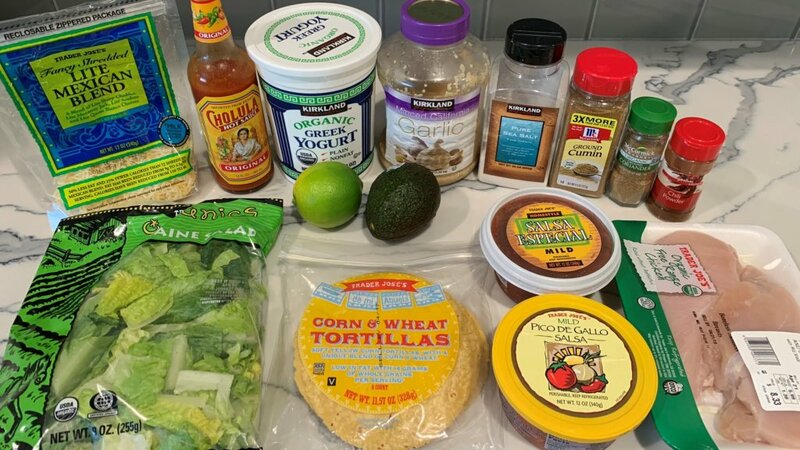 10 Minute Taco Salad, 10 Minute Turkey Tacos, Cilantro Lime Chicken, Burrito Bowl, Taco Spaghetti Skillet, Mexican Stuffed Sweet Potatoes and so many more! 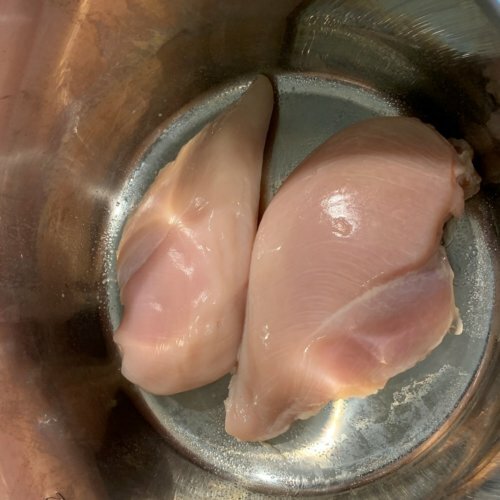 lightly spray bottom of Instant Pot with cooking spray and place chicken breasts in pot. 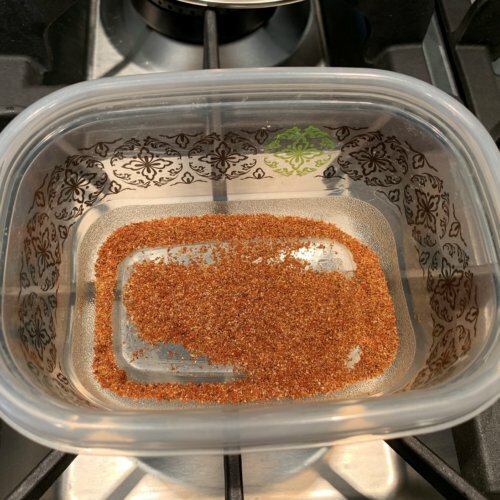 mix together spices (cumin, coriander, salt, chili powder) in a small bowl or Tupperware. season both sides of chicken breasts and top with minced garlic. cover breasts with container of salsa. 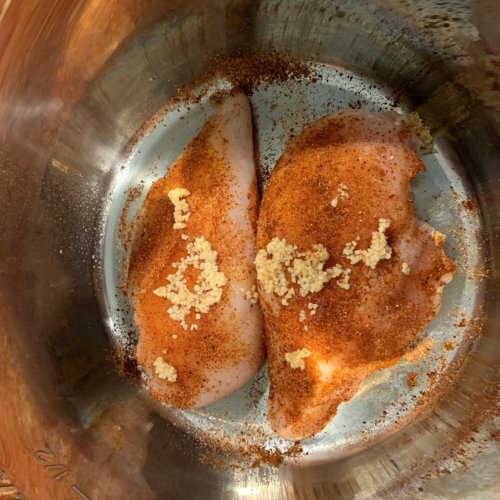 shred chicken with shredding claws and put chicken back into Instant pot. Stir with juices. toast taco shells and layer with chicken and the rest of the toppings! Enjoy! Like what you see? Enter your email to get more healthy recipes!